"Toronto Blue Jays batter Edwin Encarnacion #10 falls over as he flys-out against the Baltimore Orioles in the ninth inning during their MLB American League baseball game at Oriole Park at Camden Yards in Baltimore, Maryland on April 25, 2012." I'm a sucker for shooting from an elevated position. Clean backgrounds are such a wonderful thing. I've been playing more with teleconverters despite their erratic focusing issues on my Nikons. When I shot with Canon gear while living in Utah, I never once had an issue with images not being sharp. Nonetheless, as I've mentioned here before, baseball is about quieter moments - single images that say the story of the game. Thus must be communicated when there isn't much action that speaks the final outcome. 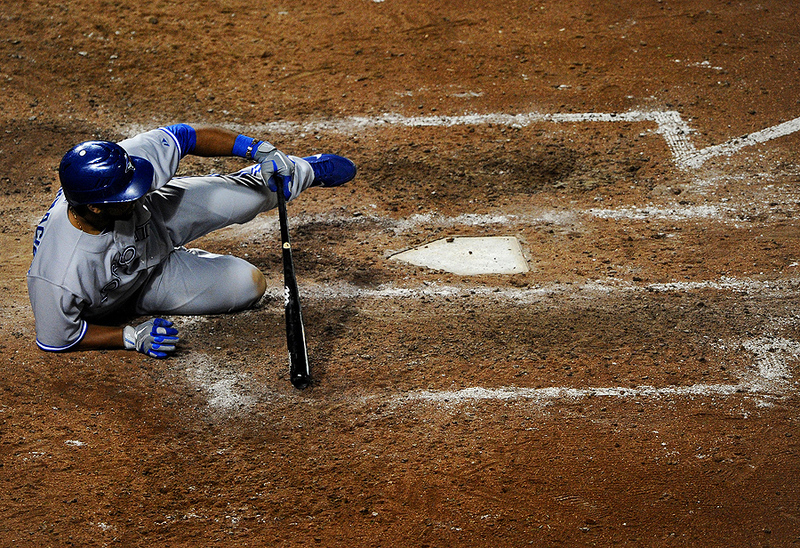 During the last inning the other night, Edwin Encarnacion of the Toronto Blue Jays fell over as he pop-flied out. It appeared as a last ditch effort to crank a home run gone bad. Alas, the Blue Jays dropped another game the Orioles. "Instagram iPhone photos taken during MLB American League baseball game action at Oriole Park at Camden Yards in Baltimore, Maryland in April 2012. Photographs were taken, edited and posted using an iPhone 4." This week I spent three days at Oriole Park at Camden Yards covering the Baltimore Orioles taking on the Toronto Blue Jays in some Major League Baseball action. As I said to a fellow shooter the first night, anyone can photograph a game with long glass, but it's a challenge to work a game with a wide angle lens - even more so an iPhone. To me, walking around a sporting event with a wide brings out the curiosity in me, which in turn, makes me slow down, think and seek pictures. I'd much rather shoot a game wide than tight, as I feel as if I'm thinking more and appreciating what others may think are mundane moments. At this homestand, during moments in which I was able to put down my large work cameras, I whipped out my iPhone every chance I had. Now I should mention, I've been sharing iPhone photos on my Modern Cliche blog for more than two years. But I'm even more excited about iPhone photography with the explosion of the Instagram app. Using this application, which has become widely popular amongst photographers and photojournalist alike, I can shoot, edit and post to the world in seconds. Not to mention, it's a social media platform which allows me to interact with other photographers, friends, professional, and/or those that are just learning to take pictures. Sure, you can debate the apps and their filters, manipulation options that makes these images not wholesome photojournalism. But if you're taking pictures in a new way, it's making your mind be creative and is opening child-like freshness you may have never knew you had. It's an exciting time to be a photographer. Sharing "digital instants" as I call them and being able to get feedback is such a rich idea. Most of my iPhone images are cutting room floor type photos, and these iPhones and the apps have their limitations. There is a song, in which a line of the lyrics are, "I love who you are, I love who you ain't." I think that perfectly sums up iPhone photography. I love everything about making images with my iPhone. At the same time I hate everything about it. Nonetheless, it is what it is. And at the end of the day, a camera is just a camera, no matter what kind it is, and it's all seeing things in a new perspective. "Baltimore Orioles vendor, Clarence “Fancy Clancy” Haskett, leans over a railing backwards as he serves a beer to a customer as the Orioles play the Toronto Blue Jays during their MLB American League baseball game at Oriole Park at Camden Yards in Baltimore, Maryland on April 24, 2012." What can I say, anyone would stop in their tracks to watch someone get served a beer like that. 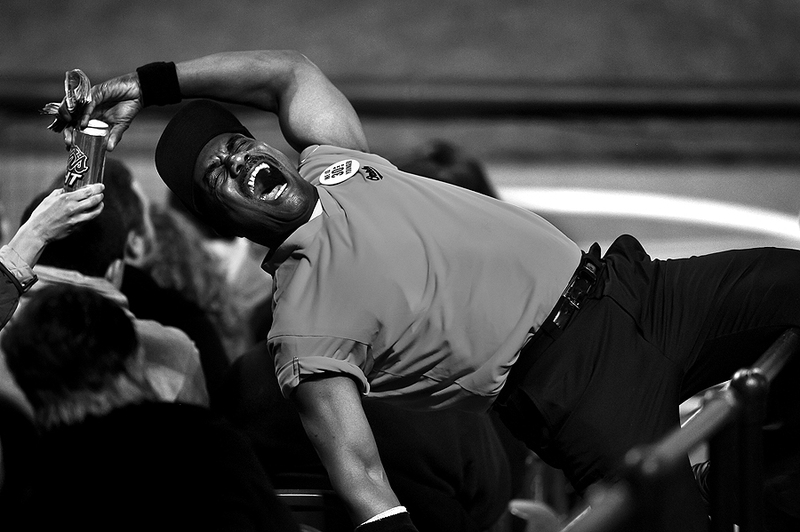 I was shooting from the main concourse during an Orioles game the other night and caught this beer vendor literally bending over backwards to serve a beer. Honestly, it made me smile, but I didn't think much of it after the fact. I even opted out of getting his name because I thought I'd never transmit the frame. Fast forward to the end of the game. I showed a friend, AP shooter and he told me to move it anyways. I couldn't help but to agree. Such a great moment. Little did I know, the next morning I found out he is quite the Baltimore celebrity at ball games. Clarence “Fancy Clancy” Haskett has sold beer and entertained fans for more than three decades at Orioles home games. That's an impressive homestand. The ironic thing of it all is, I've seen him every game I've ever shot for work or attended as a fan, but never realized his celebrity. Left the image a little wide for this post, as I thought it gave it a little more context. Although the wider frame, I think shows more of the railing. Despite my stance, I was told, and keep debating, a tighter crop. Thoughts? If anything, this is a nice slice of Baltimore history. Keep smiling and making others do so too, Clancy. 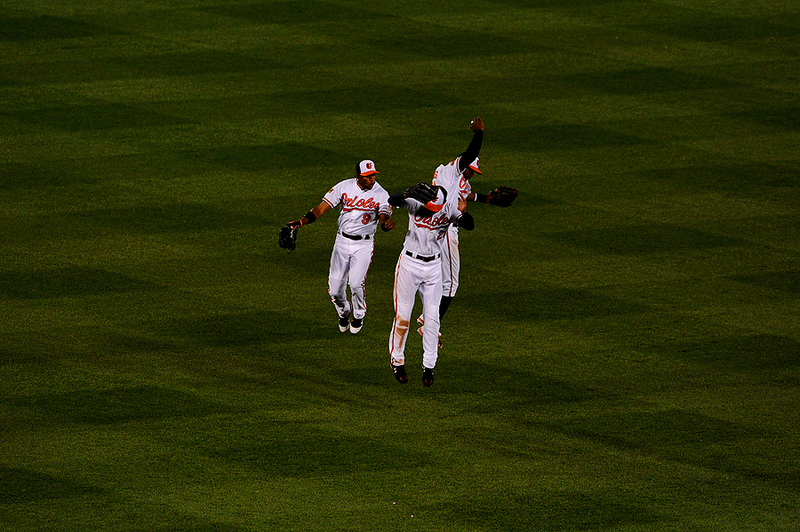 "Baltimore Orioles center fielder Endy Chavez #9, Baltimore Orioles right fielder Nick Markakis #21 and Baltimore Orioles center fielder Adam Jones #10 celebrate after defeating the Toronto Blue Jays during their MLB American League baseball game at Oriole Park at Camden Yards in Baltimore, Maryland on April 24, 2012. The Orioles won, 2-1, beating the Blue Jays for a third time in four games over a 12-day span." 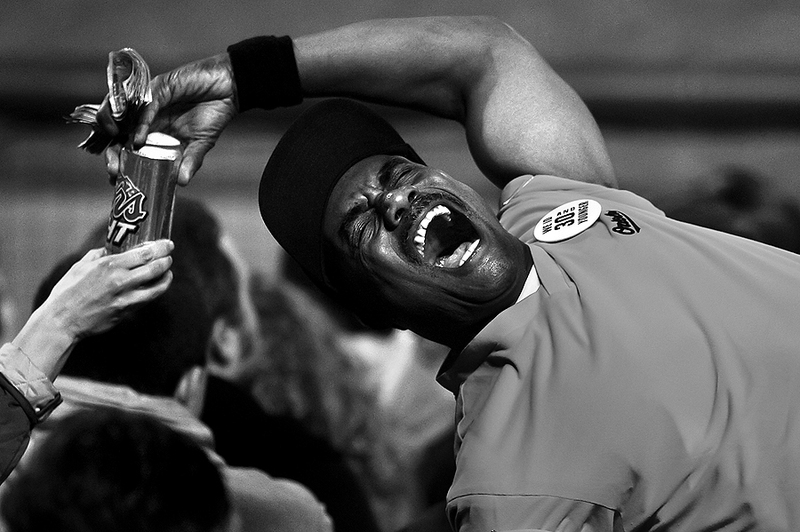 Professional sports rarely end with an epic celebration. Not to mention, this early in the season, it almost seems pointless to jump, scream and shout unless it was a last second win over a known rival or top seed. With that said, everyone is still looking for some sort of jubilation by the winning team. Tuesday night there were no walk-offs or grand performances as a fierce pitching dual took center stage. A, 2-1, O's victory and a crash into the outfield wall during a home run was all that visually told the outcome of the game. Thus is baseball sometimes when pitchers dominate the outcome. Much like most games, I get restless in the photo wells after about the third inning, so I ventured to higher ground. I think everyone that has ever photographed the Orioles has shot this frame in some variation, but I liked it loose and from above - a jube with a view - per say. 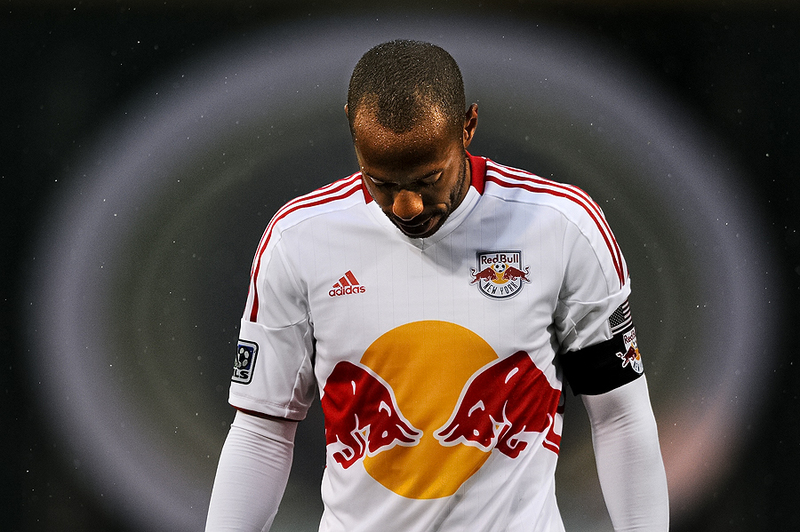 "As a steady rain falls, forward Thierry Henry #14 of the New York Red Bulls ducks his head as his team walks into the locker room at the end of the first half down, 3-0, against D.C. United at RFK Stadium on April 22, 2012 in Washington, DC." I'll admit it, I don't get star-struck or pay much attention to the idolizing fame that professional athletes sport. 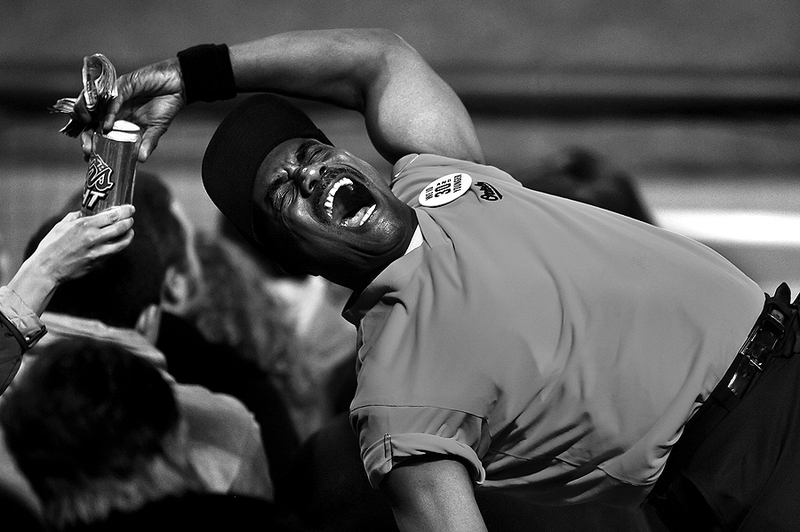 When I first began shooting professional sports, I certainly felt much more of a rush around them. Nowadays, it's just another game, with the same old cast. Despite being an athlete myself, and sharing that common bond of fierce competitiveness, pride to be the best, and addiction to be apart of the greatest team ever, I can only name a few athletes, living or deceased, that I'd ever truly want to photograph due to stature, celebrity alone. While not one of my top five, I was fortunate enough to get the opportunity to photograph a bucket list athlete on Sunday while on assignment for Getty Images - that being New York Red Bulls striker Thierry Henry. Growing up playing soccer, Henry was I name I knew and loved. Not to mention, as a huge English Premier League fan, he is the closest thing I've photographed to it to date. Although losing soundly, 4-1, to D.C. United in a very wet, rainy match, photographing him curl in a free kick to go into a first place tie for the MLS Golden Boot race, was magnificent. It was also pretty cool to see a former teammate of mine (at a young age), Kenny Cooper, running alongside him. Alas, while I wanted to document Henry blast home more than 10 goals and juke everyone on the field, sometimes you lose, and the above image summed up the night. "As New York Yankees batter Curtis Granderson (L) warms up, New York Yankees batter Derek Jeter (R) looks up to the sky as rain, sleet falls before the start of the first inning against the Baltimore Orioles during their MLB baseball game at Oriole Park at Camden Yards in Baltimore, Maryland, April 11, 2012." As I mentioned last week, Major League Baseball is back in full-swing and I was at Oriole Park at Camden Yards covering the New York Yankees Vs. Baltimore Orioles series for Reuters in Baltimore, Md. 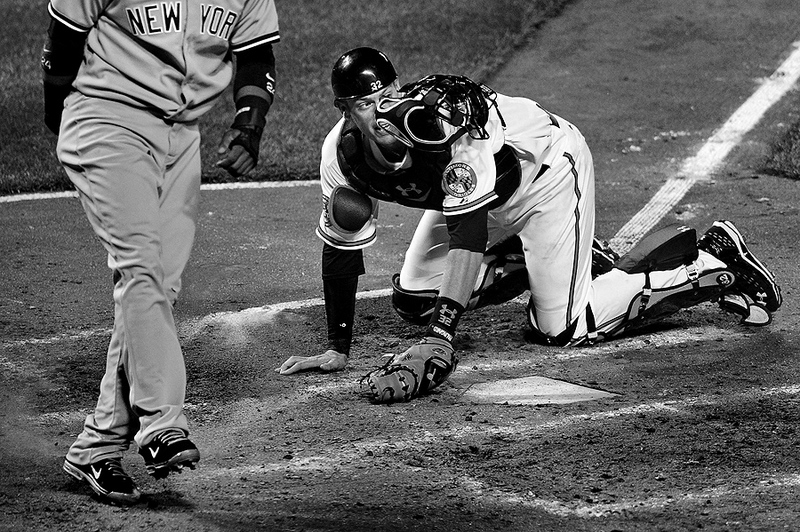 Coming into the series, a win-less Yankees team was facing an undefeated Orioles club. To say the least, it was probably a bit surprising for both teams to be on the opposite end of spectrum. The Yankees would go on to sweep the Orioles in three continually cold and extra inning nights, putting both ball clubs at even. While there were some amazing plays in the series, whether I had, missed or thought weren't important in this edit, baseball is often about quieter moments that may seem mundane by others. Actions by players say a lot about a game or series in just one picture. I'm often drawn to these moments as they are overlooked by others. These are some of my favorites from the series. I certainly had more peak action moments, but these frame before and/or after I thought communicated better to the viewer about the three-day series. "As his mask flys off, Baltimore Orioles catcher Matt Wieters #32 looks for the call after New York Yankees base runner Robinson Cano #24 slides safely into home plate in the sixth inning during their MLB baseball game at Oriole Park at Camden Yards in Baltimore, Maryland, April 10, 2012. 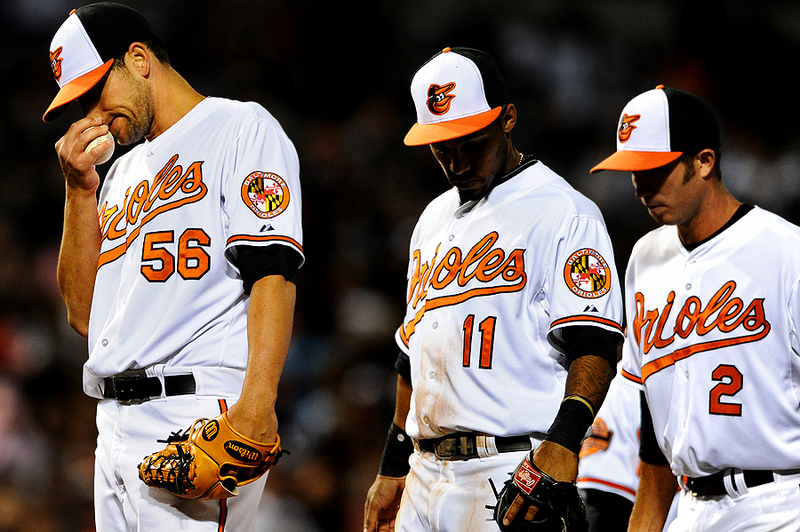 The Orioles lost, 5-4, in extra innings." Baseball is all about numbers. One of those numbers last night was twelve - as in twelve innings. Not the longest game I've ever covered, but when temperatures are dipping somewhere near freezing, taking almost five hours to finish the game late into the morning is enough to make one wish they had a few extra layers for extra innings. I can name a few photogs wishing for some warmth. The speical occasion for the night was Taiwanese left-hander Wei-Yin Chen who made his Major League debut for the Orioles. Despite giving up a home run to his first batter, it's always fun to cover someone making their start in the big leagues. A majority of my images moved for Reuters were of Chen pitching. Sometimes natures calls, and I think I shot just about every angle and shutter speed imaginable. One more game in the series before I get back to some news assignments. Better believe I've packed my hat and gloves tonight. "Before being relieved, Baltimore Orioles pitcher Darren O'Day #56 dips his head after allowing the bases to be loaded against the New York Yankees in the sixth inning during their MLB baseball game at Oriole Park at Camden Yards in Baltimore, Maryland, April 9, 2012. The Orioles lost, 6-2." Baseball is back. The boys of summer are ready for the long season and their dedicated fans are already claiming 162-0 records for their favorite ball club. The Baltimore Orioles were coming into Monday night undefeated, while the New York Yankees were looking for their first win. For me, it was my first game back, and my first game shooting for Thomson Reuters, and I was rusty. Looking back at this year, I haven't shot much sports, and it has been a solid month since I've seen any game action. The good thing is that I think I found my groove. After a slow start like the Yankees, I'm ready for some more baseball and excited to pickup where I left off last year. It's still early in the season - very early. No need to be my own worst enemy four games into the campaign. I'll be taking it inning-by-inning; and maybe waiting for some warm summer nights.